Nike has made some interesting tweaks to this high stability shoe. Notably lighter at 11.2 oz for Men, 9.2 oz for Women. It still has a 12mm heel-to-toe drop and aggressive heel counter for a locked-in fit. Most notably is the outsole design on the forefoot. The design maps the pressure path of running for optimal traction and durability with an added benefit of lighter weight, and less of the "slappy" feeling and sound. Also, the upper has engineered mesh for less seaming and stitching, which decreases the amount of material and weight while providing a smoother feel over the top of the foot. Dynamic Flywire adjusts to the shape of the foot to provide a comfortable lock-down feel. 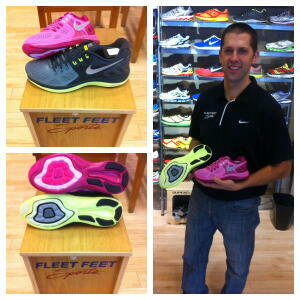 Come in to Fleet Feet Sports Madison to see if these are the running shoes for you!